Source: Howard Wainer, "Clear Thinking Made Visible: Redesigning Score Reports for Students," Chance 15 (Winter 2002), pp. 56-58. Howard Wainer (Distinguished Research Scientist at the National Board of Examiners, Philadelphia) discusses Princeton's admission letter and also the forms for reporting SAT scores in his interesting article in Chance. Perhaps the rejection letter should be less blunt. In fact, applicants can detect their fate by whether they get the thick or the thin envelope. In my view, the Princeton admission letter is undignified, paternalistic and poorly expressed. Many high school seniors receiving word of early acceptance probably won't mind being addressed by their first names. However, paired with the great big YES!, this extremely significant notification has the level of gravitas of a yellow smiley-face. One hopes the successor to the Acting Admissions Director whose signature follows the two feeble sentences of welcome will be less market-influenced. I respectfully disagree with Mr. Kolbe: this letter is extremely well-expressed. There will be plenty of time for gravity and paternalism once these bright, motivated high school seniors start their Princeton education. I imagine this letter was interpreted by its recipients as a huge and well-deserved pat on the back. It may even have elicited an intense enthusiasm somewhat similar to an accepted marriage proposal. Even humor has a place in good communication. Take a look at the original article by Howard Wainer describing the letter. Howard, who knows a great deal about visual presentations, quite enjoyed the letter along with his son Sam, the successful applicant. I think the letter effectively addresses the issue that the reader is wanting to know- "Am I in or not?" The recipeints don't have to wade through a bunch of vague congratulatory statements to figure out if they are accepted or being praised for applying. I personally enjoy this style of direct communication! In response to Mr. Kolbe's 3/14/02 comments, I should clarify that the Princeton admission letter featured in the 2/26/02 "ET Graphic of the Day" is incomplete... in fact, the section shown represents only the first sentence of the body of the letter. We do get a bit more serious, and alas, more boring, later on. I think that it is precisely because of the public's expectation of what they think a Princeton admission letter should look like (i.e. stuffy, somber, erudite) that our direct and informal tone is so welcomed. We appreciate all (well, most!) feedback. This classic letter was obviously the work of the legendary Mr. Hargadon, whose whopping personality shaped Princeton's personality for many years. My older daughter received The Yes Letter at Christmas 1993, and the younger one (soon to graduate) received hers in 1997. The letters are treasured items in the family archives. 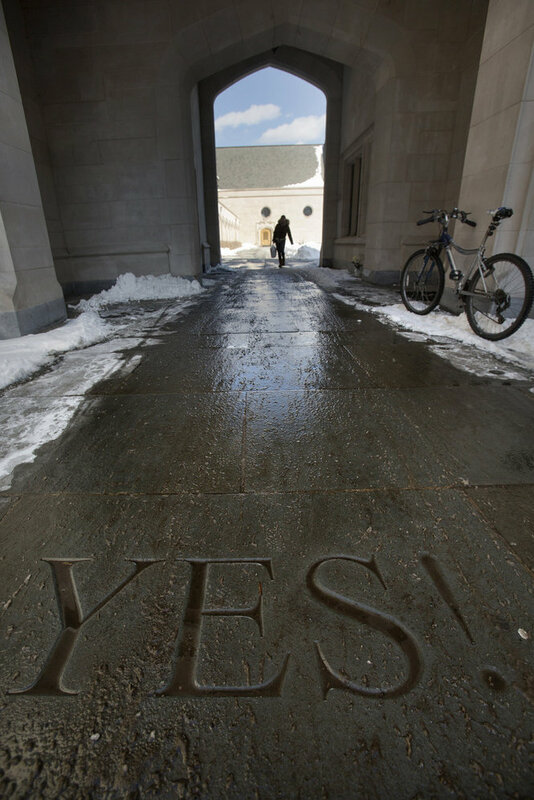 My alma mater, Macalester College, used a similar strategy: the front of their acceptance packet had "Yes!" in large white letters on a cheery green background, leaving the usual formal boilerplate for the letters inside the packet. We used to speculate jokingly about the rejection letter: did it start with a great big "No!" on a red background? I like it, but... "yes" is an answer to a question that was not asked. It is all implicit. My guess is, no course in the university is prepared to build on that use of tacit, dramatic and jestural use of language. Such a letter sets expectations, which students will naturally try to meet, and shows a culture. Here broadcasting and monosyllabic oratory are the signs of those expectations and culture, despite intent. By contrast, let's say the letter was in Latin and Greek, and says something like, "We are pleased to be able to offer you this invitation to move deeper into the life of the mind: to participate with her in the building of character and civilization, and become useful in her traditions." Start with high dignity, not low gratuity. The danger here is that such a letter will sound avuncular or arch or pompous or patronizing. The letter should not be written by a Director of Admissions, but rather by a serious scholar and educator, someone like William G. Bowen, an economist and the president of Princeton back when I taught there. Take a look at his book, The Game of Life, to see a deep level of thought about education. Obviously it works - communicates instantly and remembered forever. The letter clearly demonstrates an understanding on the part of the Princeton admissions faculty about the way applicants think of the application/acceptance process. This letter answers the question an applicant is asking as they open the envelope: Are they telling me "Yes" or "No." The moment one knows one has "made it" actually occurs when one opens the mailbox to find... The Fat Envelope! Compared to that hefty 9" x 12" packet full of booklets, brochures, forms and datasheets, the acceptance letter barely registers. The text and tone of the letter seem to imply that the applicant will attend Princeton. Do you think the admissions office will appreciate the response "No! I'm going to Yale!" As a recipient of a variation on that from my alma mater (Columbia University), I was actually quite happy that I received a folder that had (in really big letters) the words "You're In!" on it, with a longer congratulatory acceptance letter inside. As a high-school senior, the only question on my mind was "Did I get in or not?" Addressing the question in the way that they did relieved a great deal of stress for me, especially at a time when opening every letter from a college was a drama, in and of itself. The simple fact is that this letter serves its purpose effectively, expressing its message both clearly and succintly. It answers, without delay or superfluous embellishment, that burning question inside all applicants heads: "Did I get in?" While some might argue that the great big YES!, the "extremely significant notification has the level of gravitas of a yellow smiley-face", I rather think it symbolizes an enthusiastic acceptance for these high school seniors who undoubtedly deserve it. When my daughter received her "Yes!" letter, she responded with spontaneous joyful leaping. The intensity and immediacy of her reaction was precipitated by the heartiness of that "Yes!" We loved it, because there was no question about whether she was in, no deciphering or careful reading required. There was no lingering doubt but that she was accepted with enthusiasm. We have the letter archived and will always treasure it. As a person currently in the applications process (not for Princeton, but for UC Berkeley, UCLA, UCD and UCSB) I do still want the formal letter, yet the stark "Yes!" letter is an outstanding way of communicating the core amount of information at the end of a long process. University of California applicants apply in November for notification in late April. Personally, after four months of questions, additional applications and paperwork, I want to know "Yes" or "No" in a rapid manner -- as such, the letter fits perfectly. And, from what I understand, Harvey Mudd has a similar sense of humor: at one time the application packet was labled "Junk Mail." Bryn Mawr telephoned my daughter to give her the good news. I rather suspect that after saying "I'm calling to congratulate you on your acceptance into the class of 2008," the caller immediately held the phone at arm's length. Actually, I hope so for her sake, as my daughter screamed. General Charles Napier in 1842 launched a controversial but successful assault on the province of Sind to consolidate British control of India. His telegram announcing his successful annexation of the territory was the one word "Peccavi" -- a pun on the Latin "I have sinned". Although very well-known, the 'peccavi' telegram story was apparantly invented after the fact by a newpaper reporter. A similar story has been told about Victor Hugo, although I have been incapable of coming up with a source. He is said to have inquired (while in exile on the island of Jersey) of his editor if his latest book had sold well by sending a one caracter telegram : "?". The editor is said to have answered : "!". Probably one of lowest content to context ratio in the history of communication. Maybe on par with the black/white smoke at the Vatican when choosing a new pope. What about the (ambiguous) message sent by not answering a letter or email? And is there a one-word, or efficient way at any rate, of saying "please please don't acknowledge this email acknowledging your email acknowledging my email . . ."? "No reply necessary" is one way, but what would be more tactful but still perfectly clear? A bit abrupt, but close. I can only imagine that a rejection letter in the same theme would be reminiscent of the old Star Kist commercials, with a simple introduction of "Sorry, Charlie!" I can't agree with those who feel that the YES! letter is somehow "insulting" to students. I have to look back 14 years to remember the college application process, but whether my friends were applying to Harvard or Ball State, all they cared about hearing was "yes" or "no". My eventual alma mater, Bowling Green State University (Ohio), actually sent me a letter offering me a full-tuition scholarship several days before I received the official acceptance letter. I had to re-read the first paragraph several times, due to terror that the rather thin envelope contained a rejection letter, and then ran around the living room screaming. However, if that letter had simply said, "Hey, we wanna give you money to come to our school!" I would have been perfectly happy and grateful for the financial help, not sniffing disdainfully that they were not dignified or respectful enough to suit me. I'm curious to know when a simple answer became a poorly expressed answer? How much fluff does one REALLY need surrounding the answer?This is purely about knowing your audience. As adults, I'm sure the majority prefer the formal letter from (insert glorified institution name here). We've all 'been there.' How quickly we've forgotten our mindsets of 17 and 18! We are quick to make assumptions based on our fading memories. My most recent polling (for fun, really, after reading some of the replies above) on this topic includes those who've applied to such names as Harvard and Princeton; those who've graduated from names like Harvard or Cal Poly (for interest and a more experienced view/opinion); and plenty who've been just as pleased with their answers from various state schools. We are programmed with short attention spans. The simple yes or no is all any of those polled wanted to see. To consider the letter paternalistic seems a bit assumptive as well. For just a moment remember we, as humans, are inherently different in countless ways. To quote Mr. Tufte, "it's [only] information after all." One elegant touch that does not come through in this two-dimensional scan of the letter: The letter actually comes tri-folded like a standard letter. When one pulls it out of the envelope and unfolds the top flap, the "Yes!" is the only word visible from the body of the letter. Once obligatory celebratory dances have been completed, one can unfold the other flap to read the rest of the letter. "Over and out" is contradictory. OVER means "My transmission is ended; I expect a response", while OUT means "The conversation is ended and no response is expected." A trained communicator would never say the phrase. "Out" is the correct rapid exit. The power of the media to popularize that which is blatantly incorrect should never be misunderestimated. The comment by Margo Burns, "One piece that has been missing from this discussion is that most applicants to schools of Princeton's caliber are also applying to another 12-15 schools at the same time. " is probably not true. It certainly wasn't true for Sam who only applied to Princeton. Indeed since Princeton accepts more than half of its freshman class in "early admission" which prohibits applying to more than one school, there were a majority of Sam's classmates in the same boat. I believe that many Ivy League schools have a similar structure (excepting those that have a policy of "early action" which allows multiple applications). And for those who wondered, Sam is happily ensconced at Princeton doing architecture. While I enjoyed reading the "YES!" letter, I am reminded of my undergraduate and graduate admissions experiences: the excitement of applying and being accepted rapidly gave way to the actual reality of having to attend, and the occasional disappointment when a program or offering did not live up to expectations. Do we place too much emphasis on "YES!" letters from "good" schools when we might look more closely at qualities that end up influencing a student's experience most in the longer run, such as dedication to teaching or quality of advising? These aren't things I had in mind when applying, but I was swept up in the moment. Perhaps this is fodder for succinct rejection letters? I prefer Queen Gertrude's follow-up as "Tuftian" in response ... Lord Polonius, talking about brevity though not being brief, and Queen Gertrude calling him on it! "More matter, with less art" may be the Shakespearean attack on verbal chartjunk! Lord Polonius: This business is well ended. I have heard that "nuts" was a rephrased version of the original statement. A case of a single data point transcribed for a more general audience. Re: Michael Round's response: Yes, brevity is much more desirable than fluff--even when the subject is of importance. Recently I took a computer-based exam for certification in my field. At the end of the exam, I was supposed to be told whether or not I passed. I finished the exam, then waited for the result. When it came, it came buried in the text of a full paragraph of elaborate verbiage that I had to read twice before it finally sunk in that I had passed. A simple "Congratulations! You passed." would have communicated more clearly and succinctly than that paragraph. If only we could learn to think in terms of what our audience wants to know, and then stick to telling them that. Personally, I would have preferred a "Yes!" letter to the big ASCII art "thumbs up" that my school sent me. As you said, applicants can usually tell by the size of the envelope. In my case with Carnegie Mellon, I could tell by the text on the envelope itself: "This is the official FAT letter." The fat/skinny letter can be deceptive. My cousin got married and took the bar exam one summer, as did his wife. One day, two envelopes arrive from the Bar Assoc: his fat, hers skinny. Might the fat one contain a whole raft of "welcome to the Bar" info, or perhaps more info on Bar review courses for the unsuccessful examinee? Was the skinny one a terse acceptance or rejection? The two were terrified to find out which of them failed. They opened: Fat one. Congratulations. State Bar info pack. She breaks down. Skinny one. You passed, but there is a processing delay because you changed your name when you got married. Expect additional materials in a few weeks. A sub-optimal user interface there. Perhaps they could have stuffed the 2nd envelope with blank sheets of paper? On October 28, 1940 , the Greek prime minister Ioannis Metaxas rejected Bennito Mussolini's ultimatum for surrender with a single word "OXI" (ie. NO). That single word and the resulting victories against Italian forces in the winter 1940/1941 changed the course of World War II and gave courage to allied forces throughout Europe. Sometimes, a single word is all you need. Definitely a fantastically-written acceptance letter. Bright, simple, congratulatory, and a memorable way to start off a new period of academic education and a milestone in life. I honestly don't know why anyone who received this would be complaining. A 2009 note on college acceptance letters suggests "chartjunk" is making inroads to the process! "College Acceptance Letters Are Glitzier, but Rejections Are Harsher"
College admissions officers are jazzing up their acceptance notifications--sending out fancy certificates, T-shirts, tubes of confetti, or Internet links to videos of fireworks--in an effort to inspire loyalty and lock in commitments from today's fickle and worried high school seniors. While many students enjoy the new twists on what used to be just fat and thin envelopes, others are criticizing some of the changes to admissions notifications. Some students are less wowed by glitz than by old-fashioned personal letters that show an admissions officer actually read the essays. Some high school officials complain about school disruptions caused by midday fateful E-mails or text messages. And some students say the new electronic rejections--some of which are little more than "Admissions decision: Deny"--feel much harsher than the traditional letters enclosed in ominously thin envelopes. Videos. Elon University has started informing this year's accepted students by E-mailing a link to a video of cheering crowds and the words "Congratulations. You've been accepted to Elon!" followed by inspirational music and shots of the scenic North Carolina campus. After receiving complaints that its Web admissions notifications weren't celebratory enough, Binghamton University added flash animation to its E-mail last year. The University of Georgia, which has for several years greeted accepted students with a link to an animated graphic of fireworks, says this year's fireworks will be flashier than ever. Bryn Mawr, which launched its video acceptance last year, is promising an even better video this year. Fancy letters. Ithaca College three years ago replaced its single-page acceptance letter (contained in a misleadingly thin envelope) with what it calls its "Phat package"--a foot-long envelope emblazoned with the words "Something big is about to happen." Mercyhurst College in Erie, Pa., upped its game this year with a fancy new translucent envelope holding a green linen folder embossed with the college seal and the words: "You have been accepted." Certificates. Baylor this year joined many other schools, including Rutgers and Elon, in sending out suitable-for-framing acceptance certificates. Excluding the errors one reader found, this letter is an excellent example of form follows function, purposeful design, designing to purpose, as opposed to design for design sake. All that is needed initially is a YES or a NO. To state the YES so simply and enthusiastically is perfection. Less is most often more. Simplicity usually bears high impact and excellent results. I'm sure the recipients deeply appreciated the simplicity.